I just returned from one of the most amazing experiences of my life personally, spiritually, and magically. Needless to say, my trip to Manila as part of a missions team was fantastic! A team of college students from FBT headed off to Manila on June 30th, and we spent the good part of a week working with Greg Lyons in his amazing ministry there. I can’t even begin to do the ministry justice on this tiny blog, but I will give you some stats to give you an idea. The ministry is called “MegaCity Ministries, Inc” and they operate several churches in and around metro Manila. These churches each have outreach programs to the communities including feeding centers, workshops and activities, “Youth Jams” (rallys for school children), “Fun Trucks” that go out into the city on Saturdays to entertain the kids and spread the Good News of Jesus Christ, and a whole lot more. MMI also operates a Bible College with over 400 students now enrolled. One of the largest facets of the ministry is their youth camps, which this past summer hosted over 57,000 children! Read that again – 57,000. There is also a camp for public school teachers, with over 6,000 attending this year. And that is really just the tip of the iceberg. 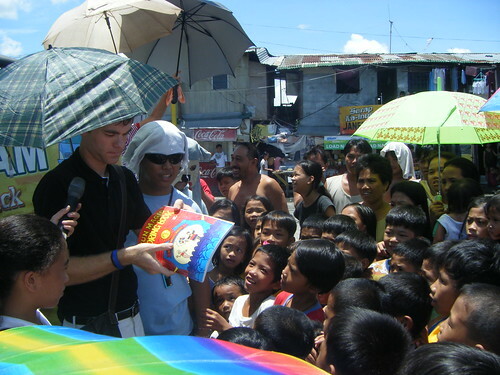 I was blessed by the opportunity to use my magic to minister to the people of Manila, and I was given the chance everyday to “perform” in front of audiences ranging from children to adults, and in venues from churches, to schools, to the streets of Manila. But this “performing” was different than I sometimes have the opportunity to do, because the focus of everything that we were doing was to share the Gospel with the people who were at these events. We saw many results, and many lives changed as multitudes of students and adults came to know Christ as their Saviour. A part of my heart remains in Manila and with the people there, and I will probably be forced to go back and check on it very soon. If you are looking for a ministry to donate your time or money to, I would like to suggest that you contribute in some way to MegaCity Ministries and the work of Greg Lyons. I will personally attest to the impact that you can have, due to their commitment to stewardship and perseverance. Their contact information can be found in the links above. You can visit my Flickr page for more pictures from the trip….